Do you know how many people come in and out of your doors every day? Even if you are only a small company of 50 people, that equates to at least 100 uses of your entrance every day. And that is not factoring in customers, clients, lunch times and deliveries. For larger companies, the numbers can easily reach into the thousands. You are going to want to invest in an entrance solution that can handle this type of constant operation. A cheaper, lower-quality option may save your company money in the short term, but long-term usage will eventually show signs of wear and tear. If repairs are then needed, you will have to pay for it out of your pocket, and should the entrance need to be put out of order, you’ll inconvenience your staff, and more importantly, your customers. Opt for a high quality entrance solution to assure peace-of-mind when it comes to upkeep and maintenance. Look for entrances made of premium materials. Ask for the mean time between failure (MTBF) number for a solution. And find out what type of service and maintenance teams are available to support any issues that may arise. We know how important security is for your company. Did you know that an inefficient entryway could not only cost your company money, but affect security levels? People come in and out of your building every day and it is important that you know and keep track of who these people are. An inefficient doorway may not have the capabilities to do so, thus comprising security and putting your company at serious risk. However, advances in technology have equipped entrances to tackle the potential security problems that businesses face in the 21st century. 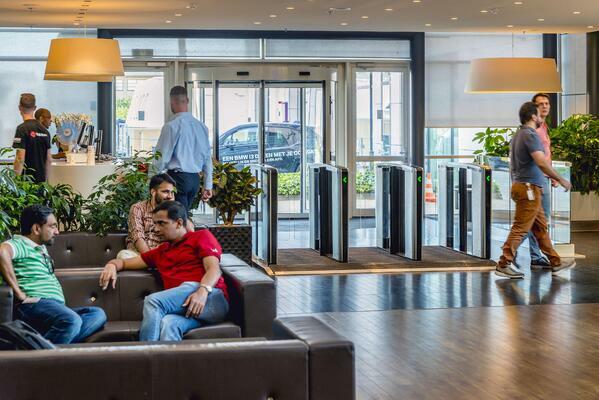 For example, optical turnstiles and access gates can provide a soft deterrent in reception areas, as well as help regulate and control the flow of people coming in and out of your building. 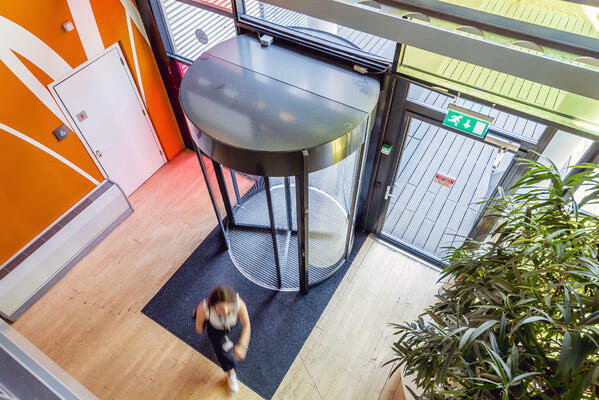 High security revolving doors and mantrap portals can prevent unauthorized entry, and when coupled with biometric devices, will ensure that only the right person gets in. All these options can heighten security in your building. Not only does this mean you may be able to reduce or reallocate manned supervision, but these options can also reduce the risk of a security incident, which could damage both your company’s reputation and finances. Click here to download a free whitepaper on how each type of security entrance differs in its ability to mitigate the risk of unauthorized entry. Being environmentally friendly not only helps protect our planet but can also help protect any potential dents in your company’s profits too. 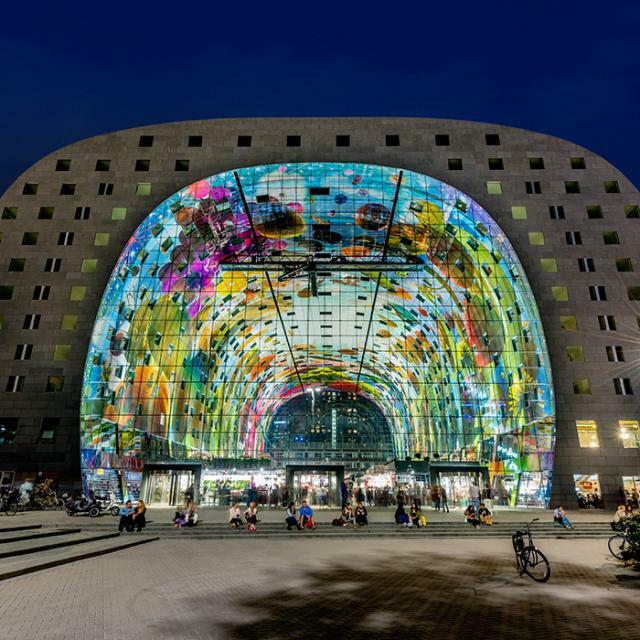 Energy costs for your buildings can make up a large part of your corporate expenditure, so cutting down on these costs is a great way to save money. Your entrance is the perfect opportunity to achieve this, particularly if you opt for a revolving door. Using revolving doors is a great way to help maintain a consistent temperature in your building. This is because revolving doors offer little opportunity for cold air to enter your building and the heat to escape - resulting in reduced heating bills. MIT even conducted a study into how much energy and money can be saved through the use of a revolving door. They concluded that revolving doors retain heat eight times better than swing doors, and would save the building used in the study almost $7500 a year in natural gas a year - enough to heat five houses over the same time frame. So can inefficient entryways cost your company money? Yes, and in more ways than one. With a Boon Edam entrance, you can be sure you are helping your company save money for the long term, and more importantly, setting the right first impression for everyone that walks through your door. To find out more, contact a member of our dedicated and experienced team of entry experts today. Tandi is a Marketing Manager at Boon Edam's headquarters in The Netherlands.